Seriously, OKC. We can do better. We're living in the golden age of Oklahoma City. Our renaissance has been noticed worldwide and chronicled in publications such as the New York Times, National Geographic, and Forbes. It's an inclusive city with unique art districts, diverse entertainment, miles of trails, riverfront attractions, world class museums, multiple street festivals, excellent restaurants, revitalized city neighborhoods . . . but its flag is uninspired. Why? It's merely the city seal on a white background. Ted Kaye outlined what makes a great flag in his Good Flag, Bad Flag. One of the cardinal sins of flag design is to use a seal. 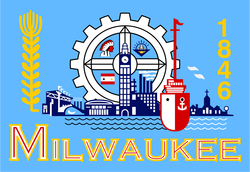 City seals look good on letterhead, but they're impossible to make out on top of a flagpole. A great flag should be easily recognized from afar. Ours isn't, but we can fix that. So let's design a flag befitting of our great city. Please send your design to okcflag@gmail.com. Most U.S. flags use a ratio of either 1:1.5 or 1:1.67. The only rules are that you use one of those ratios and adhere to Ted Kaye's Good Flag, Bad Flag principles (outlined below). ​We're certainly not the first group to suggest an update. The Oklahoman published an article in 2014 discussing this very topic. And, thanks to that article, we've partnered with DOVE Science Academy's Close Up students. This truly is a bottom-up movement led by our city's future leaders. So look out for us at street festivals, carnivals, fairs, and art walks. Encourage the artists in your life to submit designs. Once our submissions reach a critical mass, we'll submit them to City Council and petition for a new flag. Now help us spread the word. ﻿TL;DR: Our flag is not good. Watch this video to find out why. What makes a good flag? ​The flag should be so simple that a child can draw it from memory. Limit the number of colors on the flag to three which contrast well. Never use writing of any kind or an organization’s seal. Avoid duplicating other flags, but use similarities to show connections.